Catholic University students and faculty gave their feedback and input on the Academic Renewal proposal in two Academic Senate ad hoc committee meetings on Wednesday, April 25th. The feedback revolved mostly around the aspect of the proposal detailing the removal of 35 faculty by next fall, either voluntarily or involuntarily. Some of the main frustrations and concerns expressed involved a lack of transparency in the whole process, a fear of what faculty removal would do to the reputation of the university, and the role of the administration in this financial dilemma. Names of faculty and some students have been redacted to protect the agreed upon confidentiality of the ad hoc meetings. One recurring complaint from both the faculty and students dealt with inaccurate data from a main premise of the proposal to cut faculty to save money — trends in higher education. The proposal cites a report from the Center for Education Statistics saying that the number of universities eligible to give financial aid fell for a fourth straight year by “5.6 percent from 2015-16 to 2016-17.” The proposal does not note that the selected statistic is mainly related to data from for-profit colleges, while nonprofit institutions like Catholic have not experienced these sharp declines in the time period. This made many question the whole document’s accuracy. Professors proposed that the lack of transparency and data inaccuracies should slow down, or even remove this Academic Renewal proposal process. “If a premise is invalid, it invalidates the entire proposal,” one professor said. 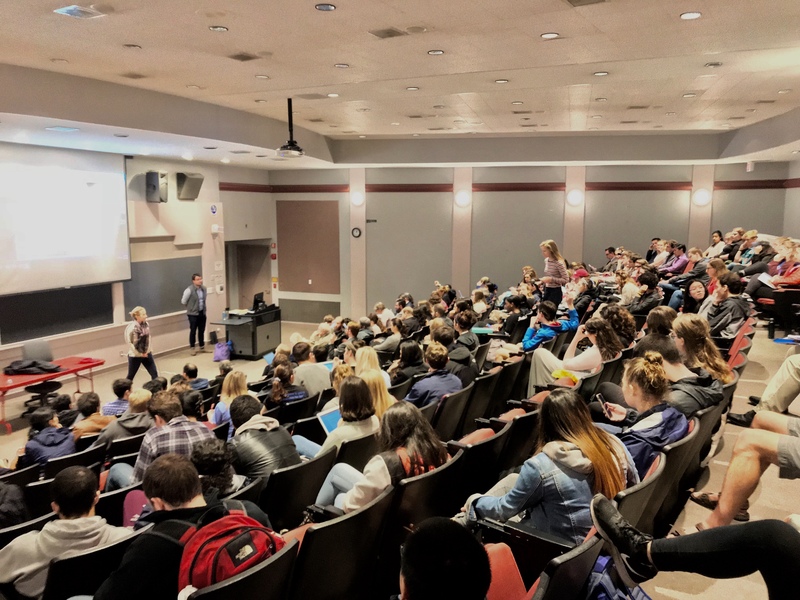 More than 150 students at the undergraduate, graduate, and doctoral levels attended the first ad hoc meeting in Hannan Hall Wednesday afternoon for a chance to share their issues with the current proposal. Many of the testimonies from students pointed out the potential devastating effects that removal of faculty in their academic programs would have. It was acknowledged that some ideas sound positive in the proposal, like increased research and mentorship opportunities, but that they lack practicality. Multiple students questioned how the removal of faculty, tenured or not, would enhance the university’s reputation as “a global research institution.” Other students mentioned that smaller departments or minors of only one or two faculty would be severely diminished, and possibly closed, if even one of their faculty members was laid off. 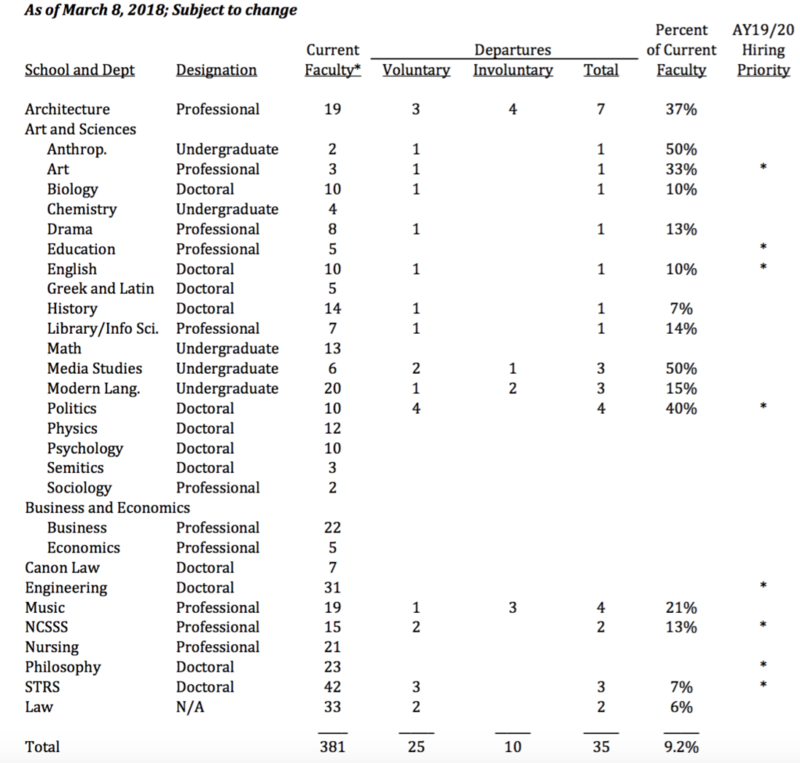 A breakdown of the projected faculty cuts in the proposal to save $3.5 million from the Academic Renewal proposal. Although unsure of how their comments would be received, students were encouraged by the turnout and passionate responses. Faculty present at the second meeting expressed dissatisfaction at being categorized as “surplus” and being kept in the dark about who in their department will be laid off. Many attendees said that the burden of the $3.5 million deficit was not just the faculty’s to bear, and suggested that the administration be reviewed for budgetary surplus like the faculty had been and possibly undergo administrative budget cuts. Faculty members also pointed out that it is difficult for the Academic Senate to fully represent the opinion of the faculty when only 20 faculty sit on the Senate, and 17 administrators sit on it. Other faculty members warned that the termination of tenured faculty would repel future faculty applicants who would be discouraged by the layoffs, and might lead to the unionization of instructors at the university. Attendees of the meetings also voiced concerns with the transparency and timeline of the proposal. The short timeframe that was provided to attend meetings and complete surveys did not properly allow for the largest participation of students and faculty. A separate ballot was presented at the meeting, created by two Arts and Sciences professors, to all Arts and Sciences faculty. The ballot was created to determine support of discarding the current Academic Renewal proposal and the development of a more thorough plan. Many other faculty members expressed their opinions during the meeting that the whole proposal should be abandoned and a new proposal should be created with more faculty input and a more indisputable data-collecting study. The meetings allowed the student and faculty voice to be heard as Academic Senate members sat in and took notes for the ad hoc committee’s report. The committee report must be submitted to the Academic Senate so they can review the feedback before voting on the proposal again on May 9th. Also involved in the report will be feedback from an anonymous survey sent out to all parties involved on April 20th. The survey lasted six days until it closed April 26th. The quick turnaround time caused many to worry at how much their concerns would actually get to the voters on the proposal, and others to take serious issue with the swiftness of the process that could end with a June 5th Board of Trustees vote. Babik Zarin, a graduate student studying library information sciences, hopes that the feedback will be considered for a better outcome. I and my family have been involved with the University in general and the School of Music in particular for over 70 years. My father received all three of his degrees from CUA. My mother and brother were students. I received two degrees from the School of Music. It is with great fear and trepidation that I read of this news. I can only relate it to a story that has circulated through the Washington musical community. There are many of us who have performed in restaurants and lounges in the DMV. The adage goes: if the restaurant is doing well it’s because of the $50 steak. If the restaurant is doing poorly, fire the musicians. Of course it is convoluted and counter intuitive, but that is how management thinks. The cuts they are proposing are band-aids on a broken arm. There are published financial statements showing the egregious rise in administrative salaries over the past year, some as much as 135%. Save money by cutting your own salary first, then, once you have felt the scar, ask other to follow. Christ told us to follow his example. Maybe you should do the same. I am a retired alumnus (class of 1961) with limited resources. So I have not always responded to donation requests. I am alarmed at the proposal to use layoffs alone to balance the university’s budget. I am sending a $100 donation, in hopes that others will do likewise in an attempt to help keep finances afloat. Thank you for this report. I am a retired Professor Emeritus (aka, an Old Fart who is no longer on the payroll) but I am still gravely concerned about the future of an institution to which I proudly devoted 35 years of my professional life. First, thanks to so many students and faculty for turning out to question a process created by the administration but whose deficiencies will be borne by students and faculty. The lack of transparency in this process has been appalling. Meetings like these help shed some light into some very dark corners. Second, a personal observation. If, as a young PhD, I read about these measures, there is no way (even in the current disastrous job market) that I would apply for a faculty job at CUA. Tenure is like a marriage: it assures the university of a permanent quality faculty, and assures the professor that the institution will support his/her teaching and research through both good times and bad, for better or for worse. When you betray that fundamental trust, you strike at the very heart of the faculty’s commitment to the institution. Essential courses get cut, teaching loads go up, class sizes increase, dissertation guidance gets neglected, research (“global” or otherwise) suffers. Again, thanks to The Tower for its continuing coverage of this issue.